The Mission Field | gather the folks. tell the stories. 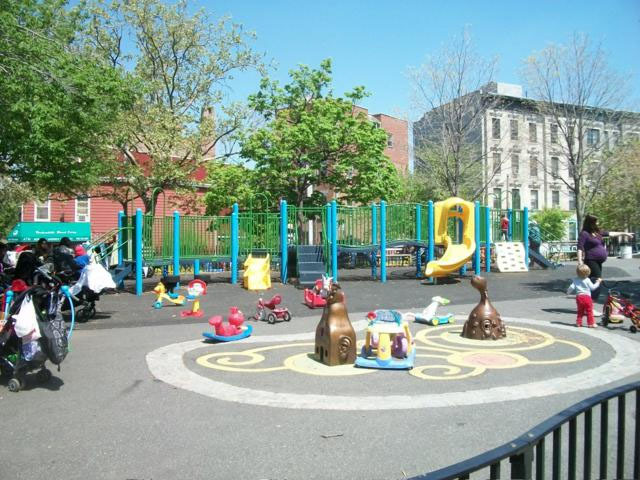 The Underhill Playground in Prospect Heights, Brooklyn. As a temporary freelancer and stay-at-home mom, I have been spending quite a lot of time in our neighborhood of Prospect Heights, Brooklyn. It is a jewel of a community, with a mix of African American and Caribbean residents who have inhabited the brownstones and prewar apartment buildings for more than a generation, alongside the expected influx over the past fifteen years or so (with increased speed in just the last 5 years) of artists and musicians, young families, and single, young professionals. Gentrification, yes, but boy am I tired of that term being used universally to describe a phenomenon that is unique and specific in each community. Some small businesses are being forced out by increased rent, yes. A lot of small businesses are finding their way in. There are no Starbucks (hallelujah! ), no national chain restaurants. The owners and managers of the businesses typically live in the neighborhood; their investment goes way beyond the profitability of their business. They walk their dogs down the block; they send their children to the local, public schools; they patronize the established businesses that long preceded them. The local playground is a feast for the eyes and the cherry on top of the sundae that is our chosen home. Renovated seven years ago, it is occupied from dawn ’til dusk with such a vast array of diversity that I’m often caught people-watching rather than child-watching… The young professionals, mostly white, though by no means entirely. Caribbean and African American. Orthodox Jewish. Japanese. German. Australian. And on a beautiful little corner, one block away from the playground, sits a Presbyterian Church. There is a large, historic Roman Catholic Church a few blocks down, and a host of storefront churches lining the larger avenues. But by and large, you would be hard pressed to identify anybody headed to church on a Sunday morning. The coffee shop is packed; the bagel shop mobbed; the playground full. The beautiful little Presbyterian church has a small (very small) faithful congregation with an average age of 70+. I think, though I don’t know for certain, that they long to engage the community outside their door, but simply don’t know how or can’t find the resources to do so. And here is where I stand, gazing in one direction to my cohort of parents with young children, sorting out the logistics of career, childcare, finances, schooling, sanity… and gazing in the other direction at my beloved ‘church’- the place where I have so often found God’s presence made manifest in worship and community. I want to bridge the gap. I want the one to see the value of the other. I want the one to be enriched by the other. I want the needs of both to be met by the other. It’s happening in some places. I know folks and communities who are doing it. It’s not happening here, in my little corner of New York City. Not that I can see. Not yet. This entry was posted in Popular Culture, Theology and tagged Brooklyn, church growth, evangelism, mission, Prospect Heights. Bookmark the permalink.